Mission Well Pump Services Provides Well Pump Cost Estimates ONLINE Quickly! We provide residential well pump service throughout the Mission area, we can also service large water pumping systems in the area. We are a One-Stop-Shop for your local water pump needs throughout the Mission area. Have an emergency well pump repair in the Mission? No problem! Give us a call and we will have it fixed in no time. Please submit your information, we'll respond quickly. Your information is private and helps up provide a complete and detailed quote for a Well Pump Cost in Mission. Mission Well Pump the are Fraser Valley's water well pump experts serving Mission and the neighboring communities. We are proud to offer great response times and give priority service to our Mission area clients. Is your well pump not operating as it should? No water in the tap? We can get your water back quickly! Mission Well Pump offers AWESOME service for local emergency well pump repairs. When it comes to your well pump problems we have you covered and are here to respond to well pump emergencies. Mission Well Pump has fully-stocked water well service vehicles along with certified water well pump professionals and pump repair service department. If you require local well pump service Mission Well Pump is able to service all water well problems and offering priority service to Mission, Silverdale, Steelhead, Hayward Lake, Durieu, Hatzic, Miracle Valley, Dewdney, Nicomen Island, Deroche, Lake Errock, Harrison Mills, Hemlock Valley, Harrison Hot Springs, Agassiz, Ruskin and Whonnock. We maintain an extensive well pump and pump-motor inventory, to handle well pump repairs and well pump installations quickly throughout the Mission and the communities. Our qualified well pump specialists has extensive experience with residential well pump systems, well pump repair, new water well pump installations, and other larger water well pump services including farms and other agri-operations. Our extensive Mission Water Pump & Pump Repair services include Municipal, Industrial, and Commercial. 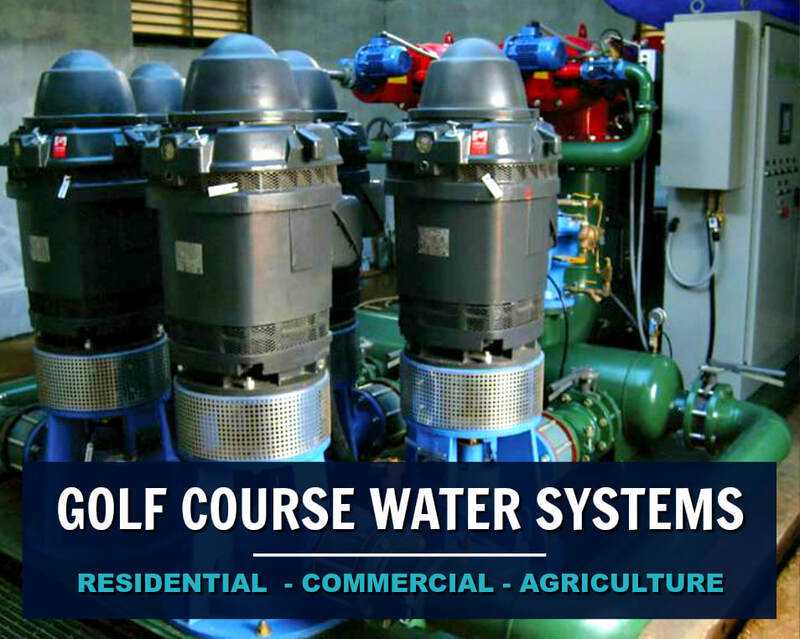 We frequently design and service Mission Golf Course Water Pumping Systems and large irrigation projects in the Mission area. Our highly-trained well pump experts are focused on maintaining reasonable well pump costs in Mission by resolving well pump problems quickly and efficiently, they take time to think through water well problems. We have extensive local-knowledge and resources to trouble-shoot aging water systems, or design a new water well systems. Request a QUICK online well pump cost estimate for your Mission water system. 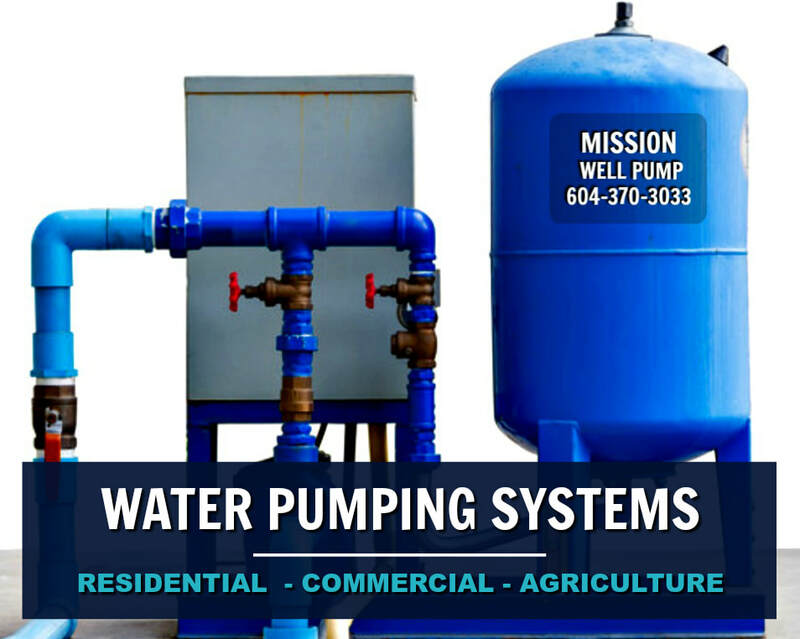 Mission Well Pump installs and repairs a wide-range of water pump systems from submersible pumps, jet pumps, booster pumps, variable speed pumps, centrifugal pumps, golf course water pump systems, turbines booster and solar pumps. We will help you decide on the best water system to suit your local water pumping needs. If experiencing water well problems, we're just a call away and happy check-it-out for you, diagnose the problem, and provide the most reliable and durable solution. Whether it's a small well pump repair or a complete well pump replacement required, we provide quality water system products and workmanship that lasts! If your current well pump needs replacing or requiring a new well pump for a drilled well, we provide a large-variety of local water system options for many Mission applications. We respond as quickly as possible to Well Pump Emergencies in the Mission area including Silverdale, Steelhead, Hayward Lake, Durieu, Hatzic, Miracle Valley, Dewdney, Nicomen Island, Deroche, Lake Errock, Harrison Mills, Hemlock Valley, Harrison Hot Springs, Agassiz, Ruskin and the community of Whonnock . Mission Well Pump is frequently called for emergency water pump problems. Well pumps often indicate there's an issue over time and may eventually require replacement. Update your well pump prior to experiencing a water pump emergency... it always happens at the wrong time! Consider replacing a well pump during the winter months or early spring. Our mild Fraser Valley weather allows our well pump pros to operate all year. Why wait for the hot summer months? Summers are the busy with a high-demand for local well drilling, well pump services, well pump repairs and new well pump installations. It can often take a lot longer to get service! Clients love our One-Stop-Shop water system program, we are experts at managing well drilling projects from beginning-to-end including new water system design and construction in Mission. Our One-Stop-Shop water well service eliminates stressful and costly water well complications experienced by property owners using multiple water well contractors who often do not communicate with each other or work together for the benefit of Mission property owners. Mission Well Pump provides submersible pumps, booster pumps, jet pumps, irrigation pumps, sump pumps, sewage pumps, pressure tanks and pressure switch replacement. We quickly sort out low water pressure problems, holding tanks, water reservoirs, water treatment and water well filter systems, broken water-line repairs and dry-well problems. We represent only the most reputable well pump equipment and water well supplies including Franklin Electric and Grundfos Pumps. We also handle other brands to meet all well pump need and budgets to maintain accessible well pump costs in Mission for everyone. Mission Well Pump has fully-stocked pump service vehicles, well pump installers and service department. We maintain a complete inventory of well pumps and water system parts and components to complete well pump installations and most well pump repairs in the Mission area. We like to arrive on-site prepared to handle sudden local well pump problems. We're rarely called to property only having to leave while you wait for us to locate the appropriate parts to do your well pump repairs in Mission. With substantial experience with constant pressure systems as well as traditional water well systems that require a pressure tank and pressure switch in the Mission and, when neatness counts you can completely count on us! 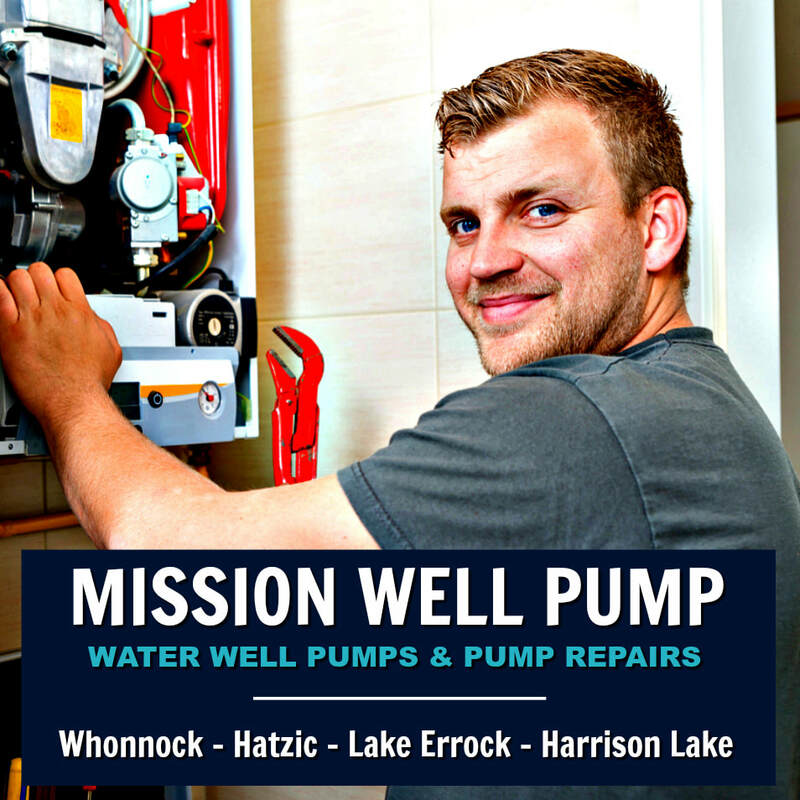 Mission Well Pump Services Water Well Pumps throughout the Mission area including Silverdale, Steelhead, Hayward Lake, Durieu, Hatzic, Miracle Valley, Dewdney, Nicomen Island, Deroche, Lake Errock, Harrison Mills, Hemlock Valley, Harrison Hot Springs, Agassiz, Ruskin and the Whonnock area. Need a new Water Well Pump in Mission? If your current well pump and water system is aging it could be time to either replace your well pump or upgrade your water system. As we mentioned earlier you might consider replacing your well during the winter months or spring, it's the quieter season. The mild Fraser Valley weather lets our well pump professionals work on most of the local Mission water systems year-round. The summer months are busy with a large demand for well drilling in Fraser Valley and well pump installations for new wells and water systems. 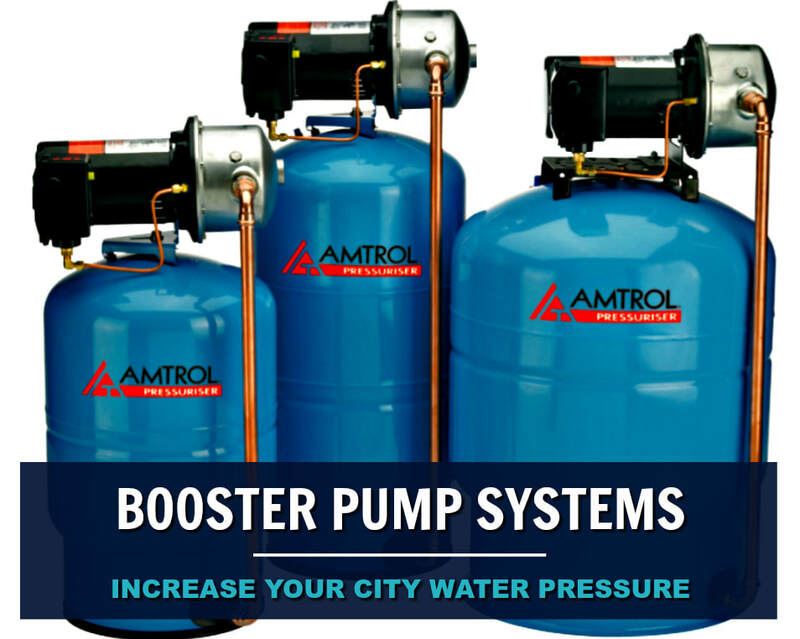 Commercial water pump installations in the Mission are will typically require considerable data collection with a very clear understanding of the operation and characteristics of the commercial water pumping application to correctly design and select the best well pump or water pumping system and equipment to service the project effectively. The water pump systems we design are unique with clear schematics. Commercial water pumping systems usually require a wide-range of flow and water pressure objectives that well require assessment in advance of the water pump equipment selection phase. 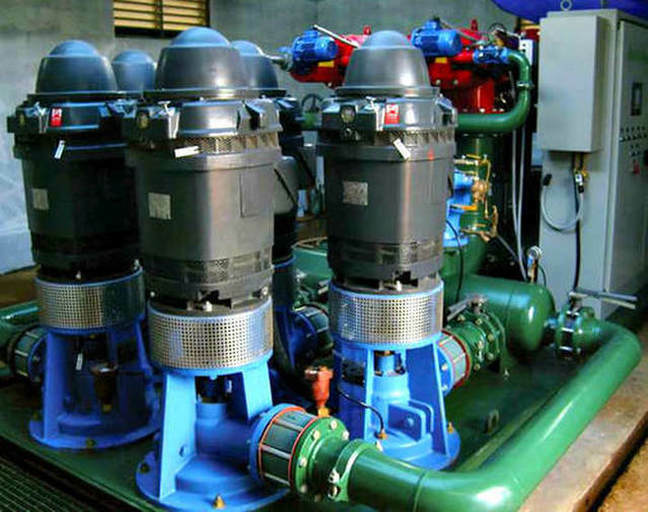 When it comes to well pumps and commercial applications in the Mission area we are experts with variable speed drives selecting well pumps or water pump systems that are not only highly efficient but exceptionally durable! Golf Course well pumps for Mission Golf Courses or water reservoir pumping systems normally operate quite differently than the average large water pumping system. Obviously, these relentless operating conditions requires golf course well pump equipment to operate problem-free, all water pumps and other equipment need to be selected and installed professionally with excellent equipment and installation warranties. Selecting correct water pump and motor combinations will generally provide extended long-term use for a Golf Course in Abbotsford and reduce the cost-of-operating. Generally the golf irrigation managers are not trained or certified to install well pumps or water pump systems within the Fraser Valley and Lower Mainland. We're available for local consultations and can advise irrigation managers of golf courses and other technicians, contact us at Mission Pump & Water Services. We provide experts Golf Courses water pumping services throughout the Fraser Valley region. Servicing many types of water systems including large irrigation for our local farming communities and other water pumping projects in the Mission area including Silverdale, Steelhead, Hayward Lake, Durieu, Hatzic, Miracle Valley, Dewdney, Nicomen Island, Deroche, Lake Errock, Harrison Mills, Hemlock Valley, Harrison Hot Springs, Agassiz, Ruskin and Whonnock. Mission Well Drilling provides premium local water well drilling services. Will you be a drilling a water well in Mission? It's quick & easy to request a FREE online quote for the cost to drill a well in Mission or the neighboring communities. Mission Well Drilling & Water Well Services is completely up-front with the Mission Well Drilling Costs, they refrain from unnecessary water well drilling practices that are not in the best interest of their clients. At Mission Well Drilling integrity is valued and the local well drillers work diligently to delight their clients! If you have well drilling questions contact Mission Well Drilling or request an online well drilling quote or give them a call all calls are returned quickly! Mission Well Drilling knows the Fraser Valley and outlying areas extensively, they are here to serve the families and local businesses in the local valley communities. Not all water wells are drilled deep in Mission, in fact many wells will be far less than 200' deep. If a water well is located near potential sources of contamination it is vulnerable and can become contaminated with the possibly of causing serious illness or even death. BC Water Well Regulations and the Ministry of Environment set-backs for water wells in Mission are required to protect water resources from becoming contaminated from a multitude of possible sources. To understand the comparable water well drilling depths in your Mission community, it's best to locate the Ministry of Environment set-backs and refer to your local resources including well drilling reports, resources are available at WELLS Database BC and local community or municipal bylaw offices. A water well drilled in Mission or the surrounding communities should be drilled on high-ground when possible to protect the well head from normal or seasonal flooding and, possible surface drainage from flooding or entering the well. Both shallow wells and deep drilled wells located anywhere in the surrounding Mission communities can become vulnerable and should always be located away from surface drainage-ditches and other possible problems and sources of contamination.